When you typically think of a ‘green’ consumer, the first image that comes to mind is probably one of an estranged friend or family member that lives in the mountains, eats granola, and recycles everything. This is no longer the case as basically every company is putting all it’s efforts into reducing their carbon footprint. If a company wants the conscious consumer’s business, it has to be mindful of the consumer’s priorities and anticipate the need for social responsibility in a purchase. By making the ‘green’ aspect part of the marketing strategy, companies can capture the consumers sense of social responsibility around this issue while creating sustainability for their brand in this new market. When it comes to luxury homes, traditionally homeowners may think that ‘going green’ means having to sacrifice or go without certain amenities. In fact, the opposite is true; we have seen modern, trendy, and luxurious homes around the world sport some of the newest ‘green’ initiatives. Below are a few trends we have seen dominate the industry. Sustainable & Locally Sourced Materials. Long before the international supply chain of materials existed, builders were forced to use locally sourced materials such as wood, stone, and clay to construct houses. We are seeing a resurgence in this practice, as it significantly reduces the carbon footprint by choosing a local distributor for materials versus ordering from across the world. It adds to the local economy while cutting down the supply chain, thus reducing the project's overall carbon footprint. LED lighting is one of the prominent trends in the green initiative. It has been proven that LED lighting is significantly more efficient than the traditional filament bulbs, allowing a home to reduce its carbon footprint without having to worry about leaving the lights on. Recently luxury retailer Saks Fifth Avenue converted their entire Christmas display to all LED lighting, reducing energy consumption. Saks has changed their entire marketing to fit the green initiative and appeal to its eco-conscious consumers. Philips, one of the leading names in lighting, has been ahead of this curve and even has gone as far to develop soft cell LED lighting, which can be added to any room or area of the house without the need for any outlets. LEED (Leadership in Energy and Environmental Design) Certification is a certification from the U.S. Green Building Council that recognizes a project’s efficiency standards. It is a point based system, the more sustainable features the project has, the more points it receives. It is currently one of the fastest growing trends in the real estate marketing, racking in $55 Million in 2015 and projecting to climb to $100.4 Million by 2018. It is also estimated that by then, more than 84% of residential construction will have sustainable features. Solar energy has come along way the last few years. Now companies like Tesla have completely hopped on the solar initiative. Recently, Elon Musk and Tesla purchased SolarCity, the largest manufacturer and installer of solar panels. The goal is to make Tesla stores a one-stop shop eventually, where consumers can purchase solar panels, Powerwall electricity storage, and choose from the growing feel of electric vehicles. In addition to the numerous energy saving benefits, the SolarCity/Tesla panels are actually more cost efficient than a traditional roof and don’t sacrifice on style either. The traditional solar panels can be visual eye sores on a roof, but the new panels are disguised as a shingle or tile and seamlessly integrate into a roof. In addition to the LEED Certification and other sustainable practices, green homeowners can take it one step further by curating their own private eco reserves. It adds the adventure aspect of nature right into the comfort of your own home. One celebrity who practices this religiously is Dwayne ‘The Rock’ Johnson. Johnson loves fishing and grew up being conscious of his environmental footprint, so he converted the pond behind his house into his own bass fishing haven. He has been growing the fish there since birth, and even has scientist come in to test the water levels for ph balance and bacteria. He can still enjoy his lifelong hobby while in the comfort of his home and without causing any harm to the environment. With the demand for organic produce on the rise, vegetable gardens have become a staple of many luxury homes & estates. It brings a new meaning to ‘farm-to-table’ and also reduces the carbon footprint of the homeowners. It provides fresh air, natural scents, healthy soil, and delicious dining options. 7. 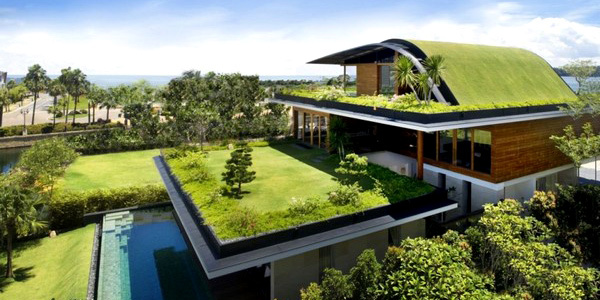 Green Roofs or Walls. Piggybacking off the trend of vegetable gardens, this is a widely adopted trend adds components of naturally efficient, energy saving practices and aesthetic beauty. Some luxury homes even go as far to incorporating vegetable gardens and orchards into the green roofs or walls. Green roofs can also help cool your home, absorbing more sunlight and diverting it away from other areas of the property.